LG had hardly introduced its new G2 flagship when they mentioned that it would come to the "big four" American carriers, meaning AT&T, T-Mobile, Verizon, and Sprint. They're bringing the fight to Samsung in this carrier-driven market. T-Mobile has confirmed the statement in the LG event: there's already a basic website dedicated to the new 5.2-inch Android handset, complete with the compulsory information signup. There's currently no date or price for the phone on any carrier. You can't say that LG isn't trying hard with the G2, now shorn of the Optimus branding. With a 5.2" 1080p screen, 2.26Ghz Snapdragon 800 processor, 13MP rear camera, and some unique design in the form of a rear-mounted volume control, this model is noticeably distinct from the Galaxy S4 and HTC One, the reigning kings of the Android world. 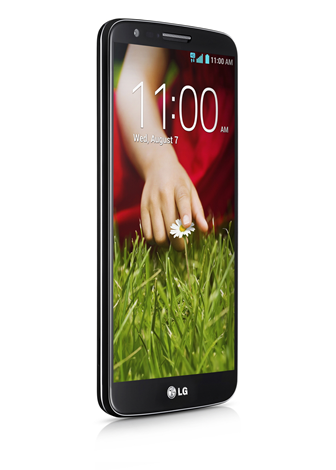 We'll see if the LG G2 can reach the same saturation as the Galaxy S4, which has expanded to most major and minor carriers in the US and Europe. 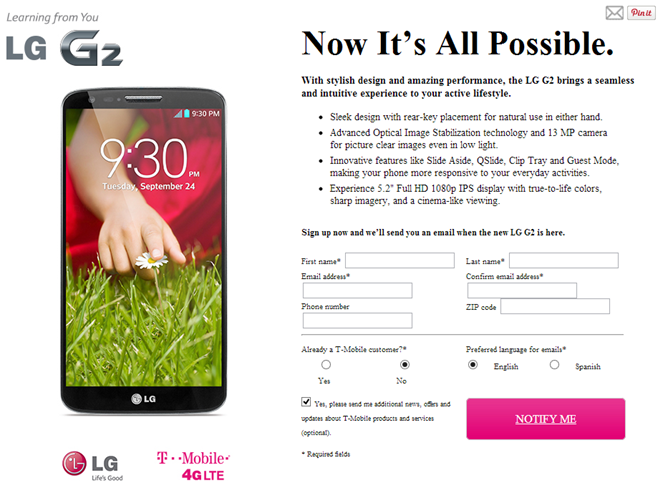 Verizon has confirmed that they'll carry the G2, complete with the usual enormous "screw you, we're Verizon" branding. The design of the speaker grille and rear buttons is slightly adjusted in the render.